I’ll admit that I love to cook…I have a small catering company that I’d love to have more clients for, but am happy to have those I do have. Having said this, you would think that I would constantly be posting about different things that I have cooked. That is not the case. Usually bloggers post of something they love that they make on regular basis or when they have made something special. The things that I make on a regular basis comes so second nature to me that I rarely think to photo document the making. The things that are “special” are usually something that comes about when I’ve got an idea in my head and I’m going to experiment. The problem with experimenting is that I never know if it will be a success or a failure (like the pumpernickel bread attempts). So when I make an “experiment” and it is successful, I can’t show you the process; because I was unsure of the outcome. In the future, I will make an effort to at least get a final photo of the creation to show you when I post about it. Having said this, I will tell you about something that I made yesterday. On Mondays we always have some form or soup and sandwich. This was something the Babydoll requested when I decided to make a weekly menu. I am one that does not like to have the same thing to eat weekly so I try my best to switch it up with something different for at least two months before I do a repeat. This week I decided to make Egg Drop Soup. Now what type of sandwich do you have to accompany that? I could only think of the Banh Mi sandwiches. However, I did not have the time or pork to make the sandwich traditional pork banh mi. I did have some left-over roasted chicken and pork from Sundays dinner (we had roasted chicken and sausages). I goggled chicken banh mi sandwiches and found one on the food network website. I decided not to pickled my julienned carrots and forgo the cilantro and instead of syrrachi sauce for the meat, I used red chili paste. So what did I end up with you ask? I took the ginger slices and garlic cloves from my soup broth and placed them in a bowl that had the chicken and sausages that I had chopped. I covered the meat in warm water and then I added 2 tbsp. of soy sauce. I covered the bowl with plastic wrap to steep while I went to pick up Babydoll from her jewelry making class. When I returned home I drained the meat and then placed about 1/3 cup or mayonnaise into the bowl with 3 tbsp. of hot chili paste. I tossed the meat in this mixture and set it aside until it was time to make the sandwiches. I thinly sliced the cucumber into long strips. To assemble the sandwiches I spread a layer of mayonnaise on the French bread and then put a heaping helping of the meat mixture atop. I placed the sandwich on aluminum foil and placed it in a 350o oven for about 15 minutes (I was looking for the edges to get slightly golden). I then removed it from the oven and added the carrots and cucumber to the top. Folded it over and I was ready to S-N-A-P. Boy was it a good sandwich. It was so good that I had it again for lunch today. It was a hit and will be revisited again by the Cork household. It had heat from the chili paste but was cooled by the cucumber and carrots. 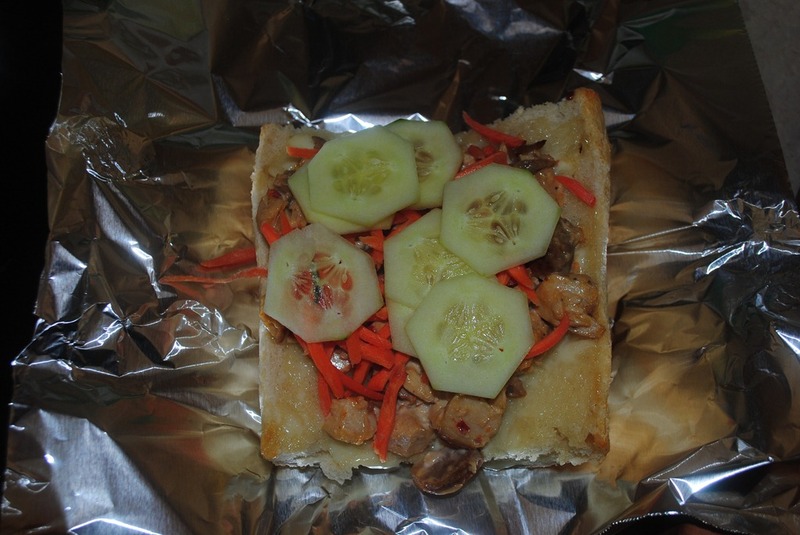 The carrots and cucumber also provided a little crunch along with the crustiness of French bread. Babydoll had a ham and cheese sub (it reminded her of a Subway toasted ham and cheese and she was very happy) and Stan had his banh mi (which he had the nerve to reply was a little spicy…this from the man that wants jalapeno’s as a side on everything). It was a good soup and sandwich day. Now…as the weather is getting warmer I am now on the hunt for some soups that are suitable to spring and summer. I know that there are cool soups that people eat, but in my mind I feel that soup should be something that is warm. If someone can convince me that a cool soup is worth it; I will give it a try and let you know my thoughts. Keep in mind, Babydoll doesn’t eat much tomato based soups (it causes reflux issues). Thanks in advance for your help and advice.